The website btc.com has a bitcoin wallet that has been created by the well-known company Bitmain. It has pioneered the popular series of Antminer mining rigs and had contributed to the development of many other bitcoin-related products. 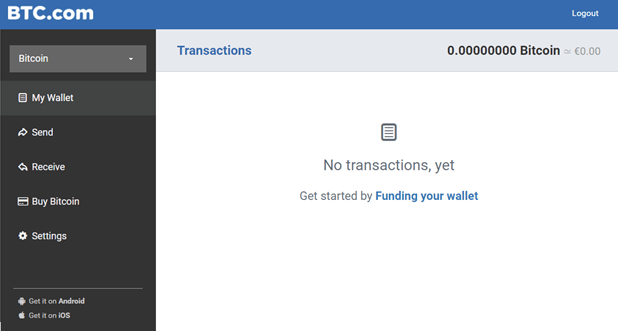 In the case of btc.com bitcoin wallet, they have managed to combine security with simplicity when it comes to user interface. The e-wallet is available online but also for android and iOS, making it compatible with any device that you have. The btc.com e-wallet let’s you buy, send and receive bitcoin and bitcoin cash for a very small fee. The user interface is very friendly. On the left top you can select the digital currency you want to use (bitcoin or bitcoin cash), then you have a “My wallet section” where you can see the history of all your transactions. Send, Receive and Buy Bitcoin are used to make transactions. Not very complicated stuff and anyone can handle with this kind of wallet. • It supports bitcoin cash since August 2017 – after the bitcoin blockchain had split into two, btc.com e-wallet continued to support bitcoin transactions but also added the bitcoin cash very quick. • Increased privacy – btc.com does not have access to private keys, unlike the third party wallets, and they ensure you have full control over your funds. • Send funds directly to your contacts – with btc.com mobile app you can send bitcoin directly to persons from your contact list. The wallet is also compatible with Android and iOS devices. Another key important feature is the ability to set fee rates based on a transaction priority. If you want your transaction processed very fast, the fee will be higher. Btc.com offers an easy to use wallet, with extra pin code for added security and two-factor authentication available. The firmware is open source and users do not need to store the blockchain. However, an e-wallet is less secure than a hardware wallet because you need to access it via an internet connection. You wallet provider does not take care of the connection you have. Also, another weak point of btc.com wallet is the fact that if offers support just for bitcoin and bitcoin cash. As a whole, btc.com e-wallet can be a reliable tool for those people interested just in bitcoin or bitcoin cash. The floating fees are one of their great features and also, the ability to send money directly to contacts from your mobile phone. You also need to consider that btc.com focuses their attention on US and Netherlands customers. Summary: The website btc.com has a bitcoin wallet that has been created by the well-known company Bitmain. It has pioneered the popular series of Antminer mining rigs and had contributed to the development of many other bitcoin-related products. In the case of btc.com bitcoin wallet, they have managed to combine security with simplicity when it comes to user interface. The e-wallet is available online but also for android and iOS, making it compatible with any device that you have.